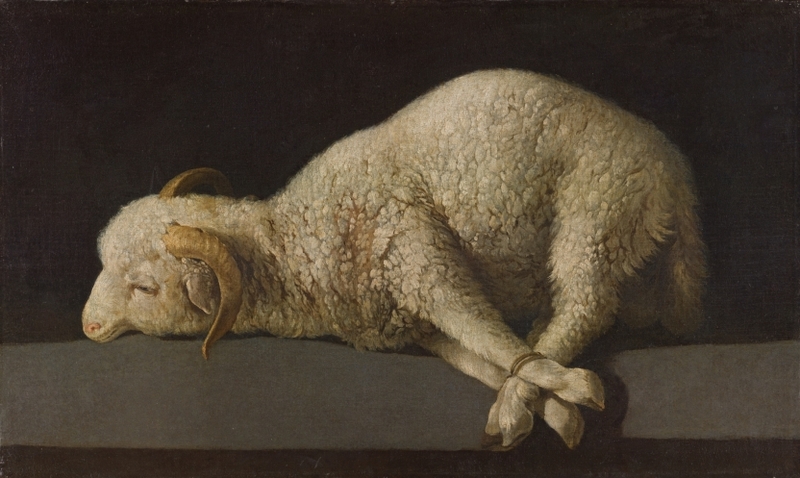 A dark background and a gray table are the setting for this painting’s only motive: a merino lamb between eight and twelve months old. Still alive, it lies with bound feet in an unmistakably sacrificial posture curiously reminiscent of famous images of martyred saints like Stefano Maderno’s moving sculpture of Saint Cecilia at the basilica of Santa Cecilia in Rome. 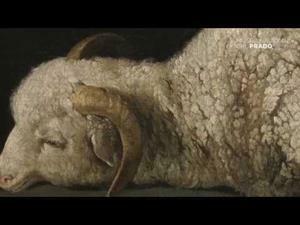 The painter draws on Zurbarán’s peerless capacity to reproduce textures, a very calculated and directed light that creates broad areas of shadow, and a meticulous technique to concentrate the viewer’s attention on a lamb that seems to meekly accept its fatal destiny. 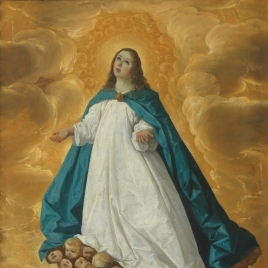 This is not Zurbarán’s only painting of this subject. The existence of five other versions by his hand with some iconographic variants indicates that such representations were well accepted, probably by private clients. Three of those versions are dated 1631, 1632 and 1639, respectively. 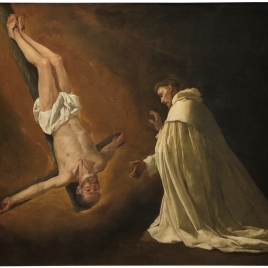 Painter and writer Antonio Palomino reflected the fame acquired by these works in 1724, when he wrote: An art lover in Seville has a lamb by this maker’s hand [Zurbarán], painted from life, which he says he values more than one hundred living rams. 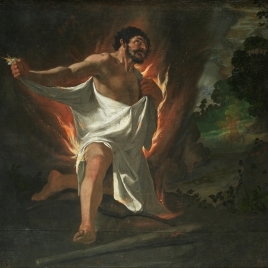 The version at the Museo del Prado is considered the finest of the five, as it best combines technical mastery, descriptive capacity and expressiveness, as well as the greatest emotional subtlety. 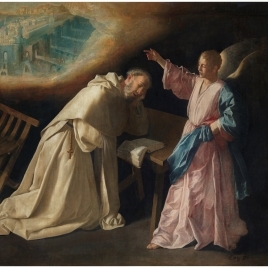 Historians agree that it dates from the fourth decades of the 17th century, and most specify 1635-1640, when the painter was at the height of his career. Some of the known versions include iconographic elements that call for a religious interpretation, such as a halo around the lamb’s head or inscriptions alluding to its sacred character. Others, like the present one, lack those attributes. While this lack of rhetorical content has led some to consider it a still life, most scholars correctly interpret it as an Agnus Dei. It is true that there are no elements here except the lamb itself, but the association of this animal with Christ -Jesus sacrificed as the Lamb of God, as the liturgy puts it- was so widespread that is seems highly improbably that a 17th-century Spaniard could avoid those religious connotations and contemplate this work exclusively as a wonder of pictorial mastery or a succulent culinary promise. 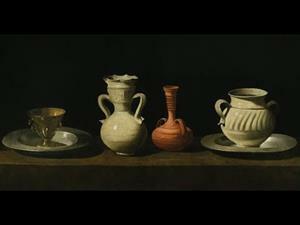 The representational formulas used here by Zurbarán -the contrived isolation of the motive and a focus on the transmission of its volume and textures- are typical of still lifes. And it is precisely this borderline condition that determines the confluence of religious painting and still life, making this an important work in the history of the latter genre, as a demonstration of the degree to which the borders between genres can be blurred. The canvas has wax seals with the coat of arms of Ferdinand VII on the back. 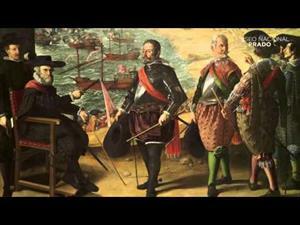 It belonged to the family of the Marquis of el Socorro until the Spanish state acquired it in 1986 for the Museo del Prado (Text drawn from Portús, J.: El Prado en el Ermitage, Museo Nacional del Prado, 2011, pp. 130-131). Height: 37.3 cm. ; Width: 62 cm. 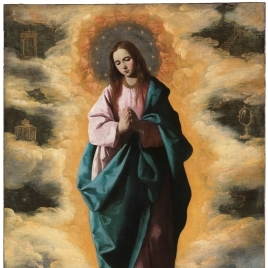 Acquired to the Marquise del Socorro, 1986.